The conical copper points that are found in the Great Lakes area of the United States were originally produced by people from The Old Copper Culture. The copper “culture” began as early as 7000 years ago by some estimates so it is likely to have embraced many cultures over dozens of centuries. The conical copper point was used for the entire time so it must have been a very successful design. Not only are they a good design but the color of the copper is beautiful. My experiments using this style of copper point have proven to me that they are also a very successful modern atlatl dart point design as well. An interesting quality of copper is that it work hardens. As you create the point it makes it very hard and resistant to damage. The tips of copper points will often bend but it is very easy to straighten them out even while you are afield using a couple of rocks; one as a hammer and the other as an anvil. I have experimented with natural copper nuggets several times but it is rare and expensive to get so I use modern copper sheets to produce the conical copper points I make. The thickness of the copper I start with is usually 1/16” or thicker. I start by cutting triangles of copper with a tin snip that are about 2 ½” long by the diameter of the dart times three and one half. The next step is to hammer the three edges so they taper down to almost paper thinness. The reason for this is that in forming the cone the two sides need to overlap. I use a ball peen hammer and an anvil. In addition to these tools I use a mandrill and a wooden block with a half cone shape carved out that matches the mandrill shape. After hammering out the edges I anneal the copper in a fire or in the flame of a torch. I then use the mandrill and wood block to begin rolling the cone, and then finish it by hammering the cone around the mandrill. The ancient Old Copper Culture People used mandrills hammered from copper. I use iron mandrills that I make on my metal lathe. I have also used temporary mandrills made of hardwood like Osage or Hard Maple. Conical points have an added advantage in that they have a very large glue surface area which means that you can use traditional pine resin glue to fasten them onto your dart shaft. I have had a few darts last several years without the copper points coming off. 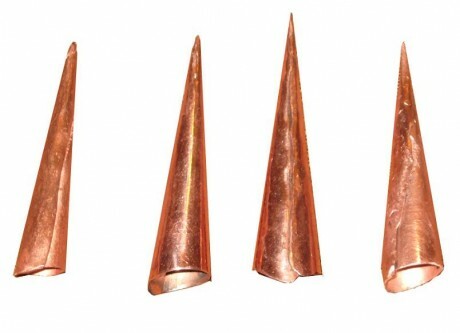 When copper points are new the tips are so pointy that they will penetrate as well as stone points or broadheads and it is very likely that people of the Old Copper Culture used conical copper points for hunting and fishing.